Dave Davidson from Revocation talks about achieving altered sounds that are not from the diatonic key of the music you may be playing. An EVH 5150 III was used for all the tones on this lesson. This is probably one of the MOST helpful and interesting lessons on this site. I love the sound of the melodic minor scale but I've always had trouble putting it to use. Thank you Dave bro. 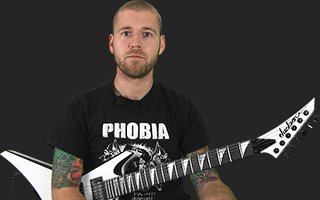 Revocation's Dave Davidson teaches you the techniques essential to his style. Dave Davidson covers some advanced topics on scales and arpeggios. He explains chord tensions and how to use them effectively. Here Dave goes over a brief summary of each mode of the major scale and talks about how each one is used. Dave covers some exotic modes and scales that he uses frequently. Melodic minor, Harmonic minor, and Hungarian minor are explained. Dave Davidson from Revocation talks about achieving altered sounds that are not from the diatonic key of the music you may be playing. Dave explains how to use the pentatonic scales to achieve a modal sound. Dave teaches you how to incorporate chromaticism into your own playing style. He starts off with some simple passing tones and then gets into more advanced lines using multiple notes outside of the scale. Get a look into the mind of one of today's greatest metal guitar players. About David Davidson View Full Biography David Davidson is a Metal guitarist that currently plays for the band Revocation. He is consistently regarded and rated as one of the top players in the metal world.